I have very generous neighbours who over the course of last summer gave me buckets and buckets of redcurrants from their bushes. Having made redcurrant jelly and redcurrant and port jelly I decided to freeze the leftovers. 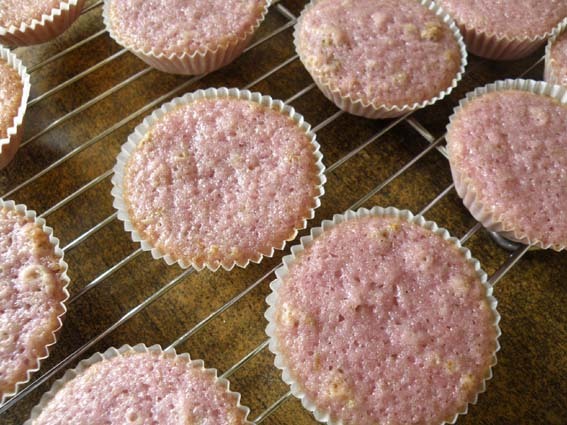 I finally decided (because I needed the room in my freezer) to make some redcurrant cupcakes so out the frozen berries came. I added the lime because,well I love lime so why not? 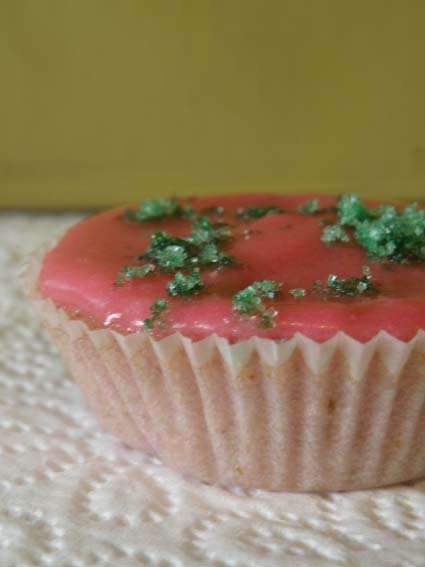 I also used the redcurrant juice in the icing/frosting which made it a lovely colour and for sprinkles sugar with green food colour in as I am yet to find “safe” sprinkles. 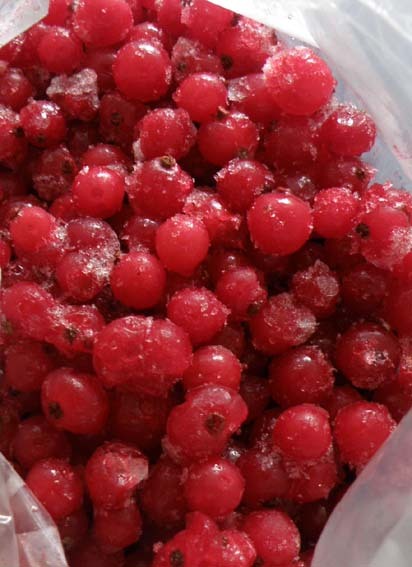 I put the redcurrants in a pan with a little water then cooked them down until soft and pushed through a sieve to get as much juice as possible. I then saved the juice for the recipe…. I reckon you could use shop bought cranberry juice in this recipe instead if you wanted. Set oven to 170 c.
Pour the wet mix into the dry mix and gently stir until combined. Spoon/pour (mine was quite liquid-like) into cupcake cases almost to the top. Bake for about 20 minutes or until slightly browned. 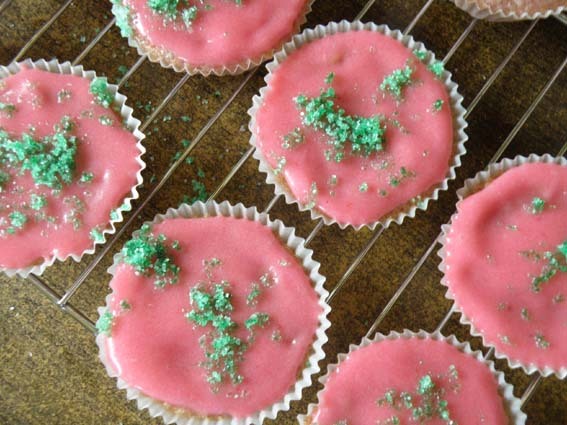 Leave to cool completely before frosting. 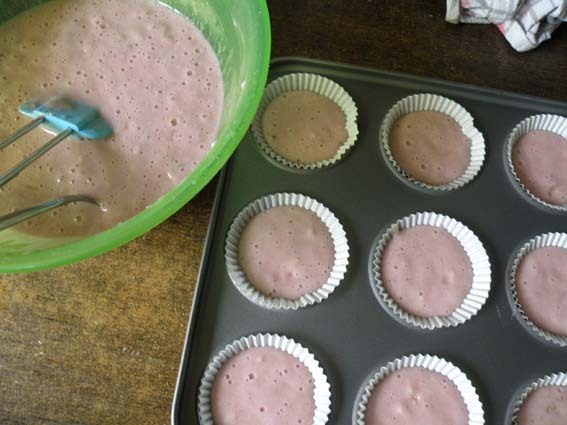 Sieve the icing sugar into a bowl, add the butter then gradually add the redcurrant juice stirring between each edition until you get a thick but spreadable icing. For the coloured sugar it’s pretty simple. You put a little sugar into a bowl and add a drop or two of colouring then stir until the sugar is evenly coated. Then sprinkle away. The boys enjoyed these, Levi got really sticky. A great use for my frozen berries methinks. I have a basket full of safe sprinkles, most of them the Cake Mate brand, which is in virtually every grocery store here. If you have friends in the U.S. military, they could probably pick some up for you from a military exchange, since my brain just said Belgium = NATO. Please forgive my brain if it just got lost in a mental fog of European stereotypes!